Born in 1966 Henrietta Dubrey grew up at the foot of the South Downs. She attended Wimbledon School of Art and the Royal Academy Schools receiving a postgraduate diploma from the latter in 1992. During this time, Dubrey was exhibiting at the Star Gallery in Lewes and was still based in Sussex. From 1995 she lived and worked in Normandy, France, having married and started a family. A move to West Penwith in Cornwall in 2000 allowed for a full immersion in the artistic heritage, namely the “middle generation” St Ives artists associated with the area, who have always been a vital inspiration to her creative process. 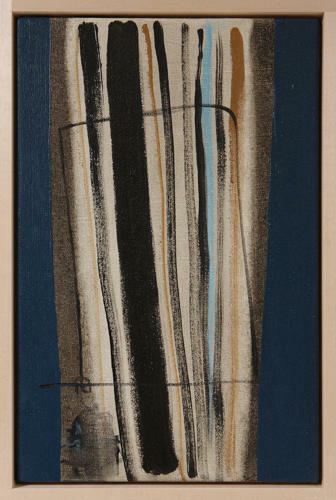 Dubrey exhibited with the Belgrave Gallery in St Ives and London, consolidating her connection with the artists such as Terry Frost, Sandra Blow and Roger Hilton. Formative experiences have included a trip to New York in 2006 which resulted in Dubrey’s series of White Paintings and the publication of an associated book. In 2011 a move to Edgar Modern Gallery in Bath saw a new direction in the painting. Dubrey started to exhibit her figurative paintings alongside her abstract canvases. This was received with great success and lead to an exhibition of paintings in the South Kensington and Marylebone Skandium design stores in London. In turn this led to her paintings being used in the 20th anniversary edition of Absolutely Fabulous broadcast at the New Year and the opening of the Olympics in 2012. Dubrey exhibits internationally and her work is held in public and private collections.